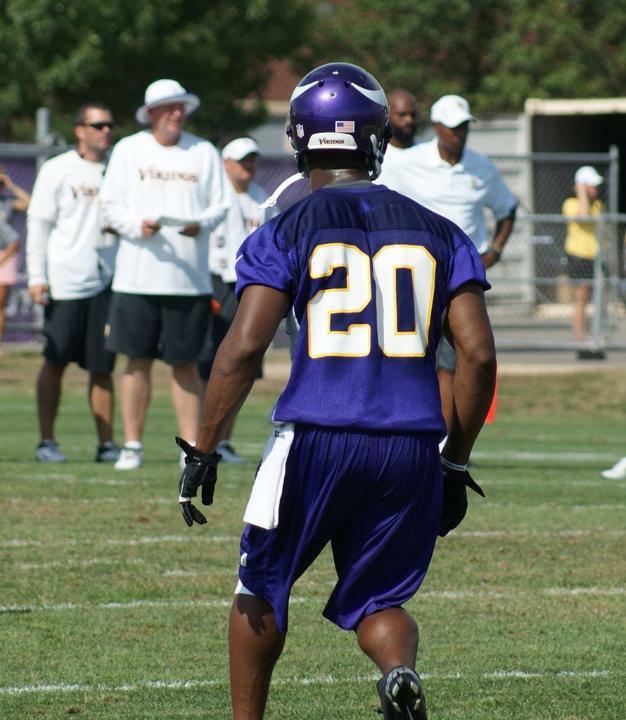 continues to impress at Vikings camp. The Vikings wrapped up their last public practice before they prepare for the trip to San Francisco. They are holding a walkthrough today which is closed to the public, as they prepare for the game tomorrow. The Vikings offense looked as shaky and possibly even more shaky than on Monday's practice. Based on Wednesday's practice the Vikings have many things they need to analyze before Friday's first preseason game in San Francisco. The Vikings offense reverted back to the same dismal performance we witnessed on Monday. Christian Ponder had a shaky performance from the start beginning with a sack by Jared Allen and a quick Chad Greenway interception of a attempted swing pass to Toby Gerhart. Ponder also threw another interception, which was a high pass intended for Michael Jenkins. Zackary Bowman made an excellent play on the ball, jumping a route that Ponder telegraphed to Jenkins. The concern I have from yesterday's practice was Ponder's poor decision making. He was holding the ball too long, which resulted in him attempting to "thread the needle" in space. He struggled with this in his rookie season and it resulted in turnovers, that were critical in close games. Ponder's completion percentage also took a dive as he dropped to 7 of 14 in team passing drills. It will be interesting to see Ponder's efficiency in the first preseason game tomorrow. Blair Walsh continues to kick the ball with great consistency. He drained all eight of his attempted field goals on Wednesday. This brings his kicking percentage up to 86%, which is very good for a rookie. Most NFL teams look for a rookie kicker to have a percentage of somewhere around 75-80%, so Blair Walsh is slightly above average. Defensively, the Vikings defensive looked very impressive in all facets. They were getting an excellent pass rush which resulted in opportunities for the secondary to make plays. Last year, the Vikings secondary missed out on these opportunities, but seem to be executing very well throughout training camp. Players like Zackary Bowman and Chris Carr, have added a nice veteran presence to the backside of our defense. I like the way Chris Cook has improved his game this season. He is the most improved cornerback in camp and has shown he will make an impact this season. He breaks on the ball extremely quick and his size matches up well with the best receivers in the league. The Vikings will need the secondary to produce this season and currently it seems like that is happening. We had our first scuffle break out today during third down passing drills. Percy Harvin welcomed rookie safety Harrison Smith to the roster with a nice facemask to facemask meeting. Harvin caught a pass across the middle from Ponder and he collided with Smith. Harvin didn't like this and made sure Smith understood. Jerome Simpson ran across the field and separated the players from the fight. About 12 other players joined the scene in breaking up the scuffle. I like the intensity both of these players are displaying and hopefully it carries over to game situations. At least we aren't seeing the fights at Vikings camp like some that are taking place in New York Jets camp. It's nice not to be in the spotlight for those types of things like the Jets have. Coach Frazier announced today that he expects the starting offense to participate in the first drive of the game on Friday, but this is dependent on the success of the first drive. He did say that he wants the offensive line to get some time as only two offensive lineman are returning as starters. He feels they need to develop some continuity before the regular season begins. Frazier also announced that at least seven players will miss Friday's game including, safety Robert Blanton (hamstring), tight end John Carlson (knee), receiver Kamar Jorden (hand), tackle DeMarcus Love (pectoral), guard Geoff Schwartz (sports hernia), halfback Jordan Todman (ankle) and cornerback Josh Robinson (hamstring). Frazier hopes these players can return quickly so they receive game action before the regular season begins. Overall, the Vikings have things they need to work on and the first preseason game will give us an indication of whether or not they are ready for actual gameplay. We will keep you posted with the latest information leading up to kickoff tomorrow evening in San Francisco.